It is with great sadness that the family of the late Alfred Joseph Hoven announces his passing. 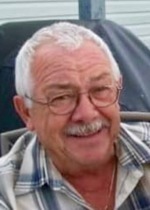 Alfred passed away from the Carmelite House, Grand Falls-Windsor, NL on Tuesday, March 19th, 2019 at the age of 78 years. Predeceased by his parents – Raymond and Elizabeth; brothers – Dan and Mark and sister – Catherine. Left with fond and loving memories are his wife – Doris; children – Catherine (Roger), Edward, Linda (Randy), Paula (Jason), Brian, Rodney (Priscilla), Raymond and Laura; 11 grandchildren; 2 great-grandchildren; brother – Lawrence (Anna) and sister – Dorothy (Jim). Pastor Keith Lane conducted the Funeral Service from Harvest Time Pentecostal Assembly, Pacquet, NL on Friday, March 22nd, 2019. Interment followed from Harvest Time Pentecostal Cemetery, Pacquet, NL. As an expression of sympathy, flowers are gratefully accepted, or donations may be made in Alfred's memory to the Alzheimer Society of Newfoundland and Labrador, 835 Topsail Road, Unit 107, Mount Pearl, NL A1N 3J6.